Although I normally don’t like to look too much at mid month numbers, the heavily requested mid month market update is back. Like i’ve been saying for awhile, it’s a tale of two markets. The detached and condo markets appear to be going in very opposite directions. Sales have had a decent uptick from August 2016 but keep in mind that was the first month of the foreign buyers tax, a move that stunned the market. 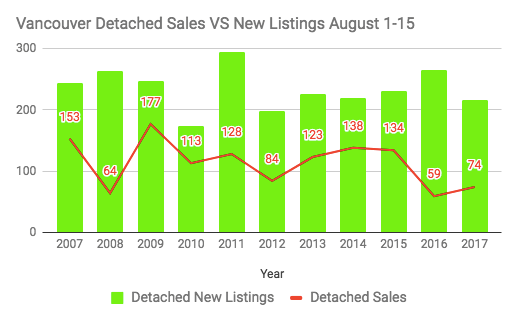 Vancouver detached sales through the first 15 days of August hit 74 total sales. This was good for a 25% increase compared to last year. However, it was still the third lowest totals in the past decade. Sales continue to putter along, dragging it’s feet, particularly in the Luxury real estate market where sales have plunged 27%. New listings have also dropped in the first few weeks but appear to be settling in right around it’s ten year average. Vancouver Detached Sales Tracking Higher than August 2016. 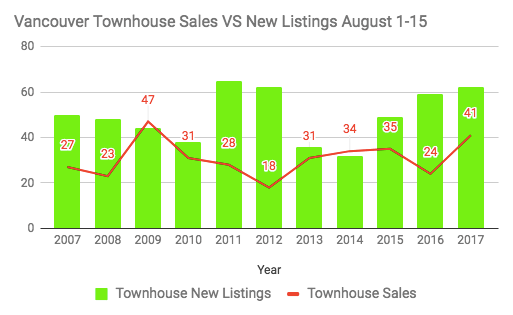 Townhouse sales are also on the upswing. This is partly attributed to new inventory hitting the market. Vancouver townhouse sales jumped from 24 sales in August 2016 to 41 this year. New listings picked up by 5%. Vancouver townhouse new listings increase 5% compared to August 2016. As I mentioned in my latest Vancouver Condo Report, sales remain quite strong amidst record low inventory. In July, 49% of Vancouver condos sold over asking price. 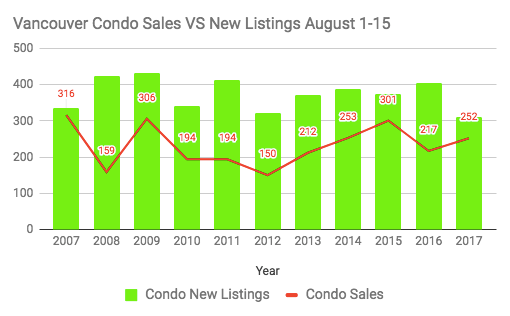 Here we can see sales are trending higher than in August, 2016 while new listings have dropped. Condo sales trending higher than August, 2016. The important distinction here is that we are comparing the same time period to last years historical announcement of a 15% foreign buyers tax. Sales unsurprisingly are higher this year as buyers have now digested the tax. With that being said, sales continue to trend below normal levels in the detached market. Little relief appears on the horizon for prospective condo buyers. Next articleDid The Vancouver Foreign Buyers Tax Work?